HEINKEL is specialized in providing systems for solid-liquid separation. 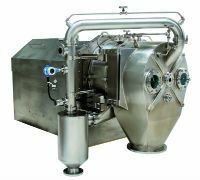 Their product portfolio consists of a wide range of vertical centrifuges, horizontal peeler centrifuges, sedimentation & classifying centrifuges, inverting filter centrifuges, ball segment valves and laboratory centrifuges (vertical and horizontal). HEINKEL joined the group in 2005 and took over Ellerwerk in 2007. The Ellerwerk products live on under the Heinkel brand.